BR #4: Guesthouse (second level), 1 King, garden view, private bath. Add $500 to include guesthouse. Rates based on 6 guests in mainhouse, max. 2. With casita, max. occupancy 8. This is where the "Sun" (Sol) and (y) the "Sea" (Mar) converge to bring you the best of times at Solymar Akumal vacation rental villa. 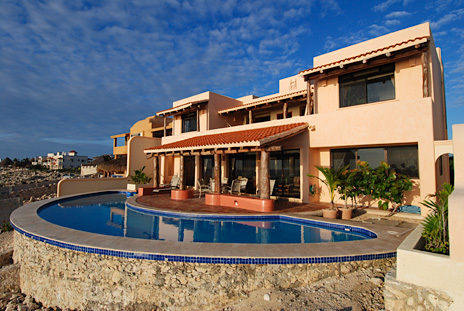 You are truly in the lap of luxury in this incredible oceanfront villa. Follow the winding drive through a lush tropical garden to the entry of Solymar. 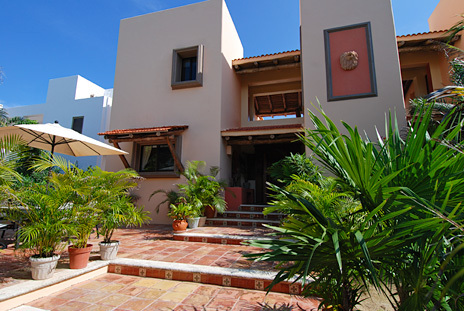 Hidden from the road, the Solymar vacation villa offers privacy in an exotic tropical setting on the Caribbean sea. 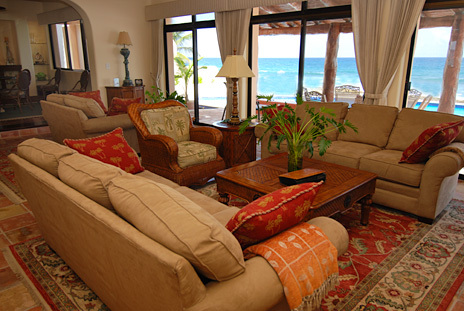 This Santa Fe style home features Tommy Bahama furnishings, original paintings and Oriental rugs. 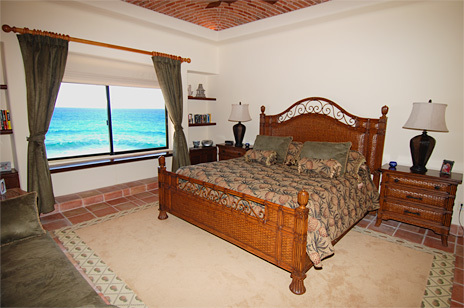 All rooms in the main house have stunning views of the ocean and all are air conditioning. 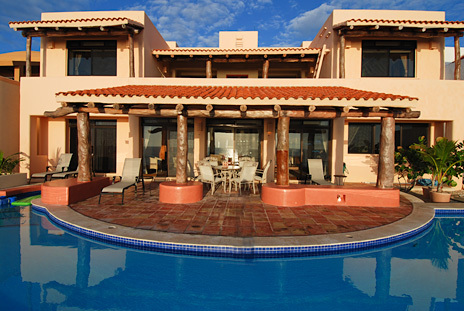 On the main floor of this amazing Akumal vacation rental villa, an elegantly furnished living room offers comfortable seating ares, entertainment center, bar and selection of games. Sliding glass doors open onto the pool and patio deck. Oppositive the living area, is the dining area with a glass-top table supported by a marble base with seating for up to 8. Additional seating is available at the kitchen lunch counter. 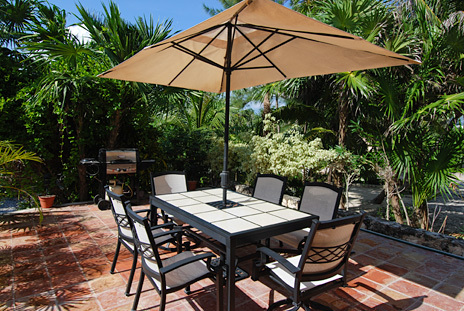 In addition, there is outdoor dining areas in the garden patio area as well as the poolside patio. Kitchen in the mainhouse is fully equipped for everything you need to prepare to prepare a complete gourmet meal or make simple snacks. 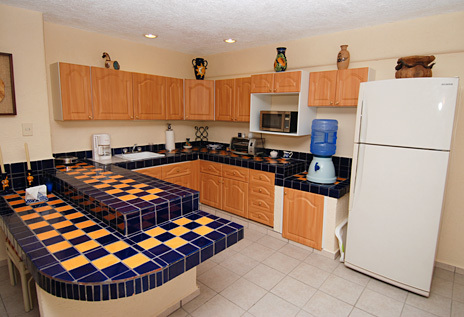 Ahh, but you're on vacation, so you might prefer to let the cook prepare an authentic Mexican meal for your group. One of the three bedrooms in the mainhouse is on this first level, as well. The "Oriental Room" has a King-size bed with sumptuous red silk furnishings and antique bronze Buddhas from Japan and private bath. Also on this level is a half bath off the living area. On the second level are two additional bedrooms, both with handsome illuminated brick domed ceilings. 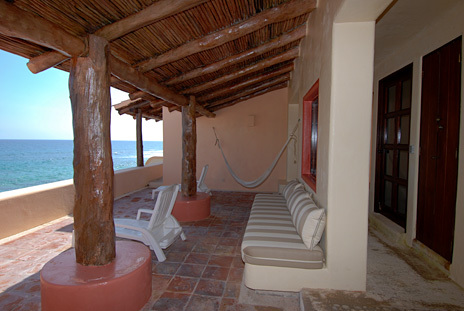 Between the bedrooms is a large private outdoor balcony which is terrific for shade or sun, lying in a hammock or working on your Coppertone tan. 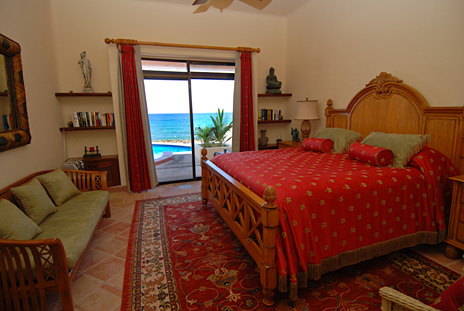 First bedroom upstairs is called Las Pinas (the pineapples) because of its dark Tommy Bahama Rattan and Wicker King-size bed and furnishings decorated with pineapple fabrics and a pineapple trimmed rug. 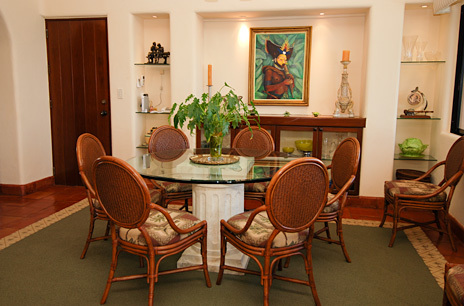 This room is also adorned with reproductions of fascinating Mayan artifacts and an original Bill Guynes portrait of a Mayan woman. This bedroom has a private bath. 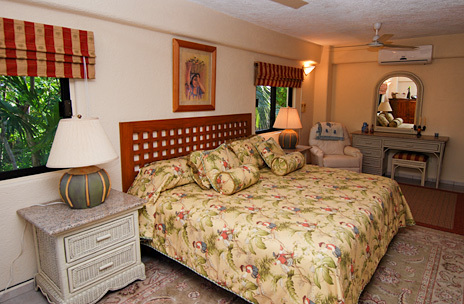 Second bedroom upstairs is called Las Cocas (the coconut palms) and has two twin beds with white wicker furniture, oriental rugs, coconut palm fabrics and lamps as well as original paintings by Gayle Walker. This bedroom also has a private bath. 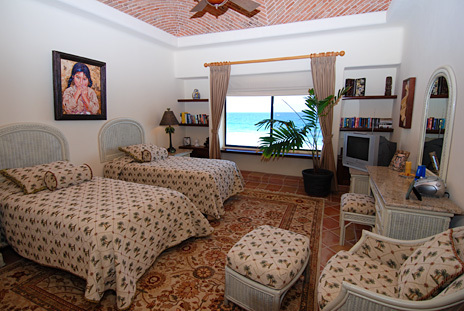 The views of Half Moon Bay in Akumal are gorgeous from every room at Solymar vacation rental villa. 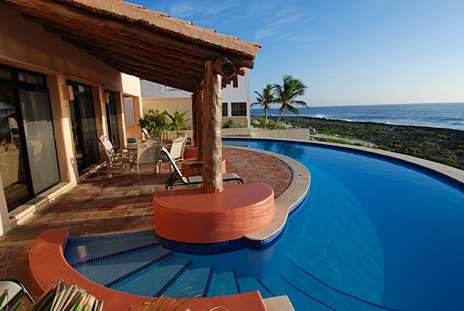 The oceanside views are enhanced by the unique and elegant pool. 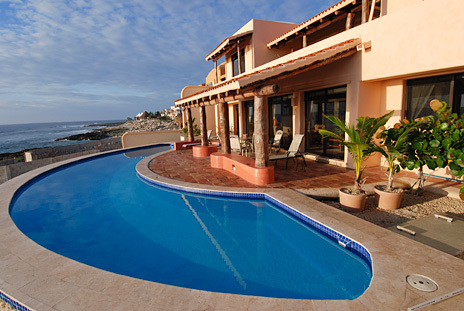 As you can see in the photos, this large half-moon pool appears to wrap around the sea side of the Solymar, creating an "island" for the patio area. Seated at this patio area, you are enveloped by the pool with a backdrop of the coral reef as boats gently sail past. It is truly a panoramic view of the aquamarine Caribbean Sea. Meanwhile, back in the garden area is a quiet air conditioned guest house on the second floor over the garage. The guest house has a private view of the surrounding gardens and birds. This room is called the Jungle Room because of the views and furnishings which include lots of wicker furniture and monkey fabrics. 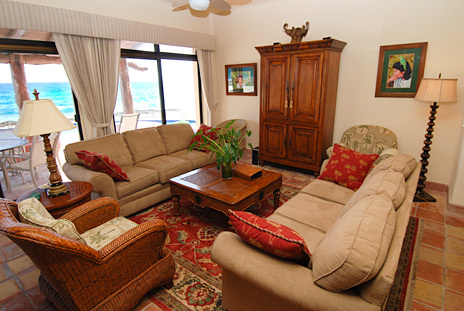 It has a King-size bed, sitting area with TV and movies, kitchen and private bathroom. 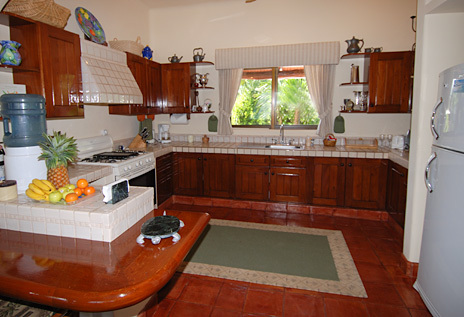 Solymar is an ideal vacation rental villa if you want something special in Akumal It is comfortable, beautiful and private. Don't miss Solymar for a travel experience you'll remember forever.